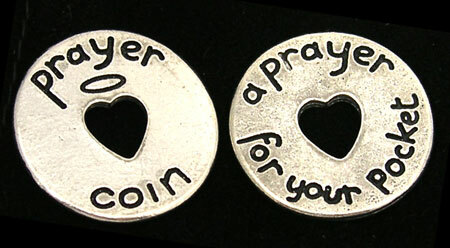 Prayer coin reads: Prayer coin, a prayer for your pocket. Pocket tokens are made of lead free pewter and are about 1 inch in diameter. PLEASE NOTE, THESE ARE A CLOSEOUT ITEM AND QUANTITES ARE LIMITED.